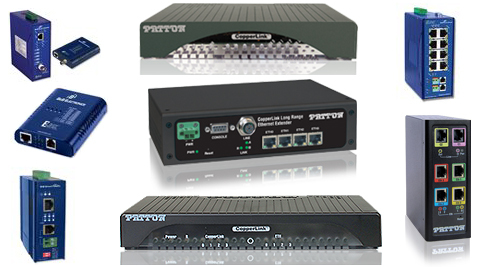 Ethernet extenders allow users to expand their Ethernet connections beyond the 100-meter Ethernet distance limitations. Ethernet can establish long-range, high-speed data communication links between geographically separated LANs or LAN devices. Ethernet are often employed to connect workgroups on different floors within a building.Ethernet are an innovative communications tool that can save integrators and installers large sums of money. One benefit of Ethernet is they can eliminate the need for installing expensive switches and category cable. Ethernet use copper twisted-pair cables to transparently send packets at full-line rate to a peered LAN up to 8 km away. While networks typically deploy Ethernet extenders within a limited geographical area, this area need not be limited to one building. Ethernet extenders can create effective bridged-Ethernet connections across streets or over a college or enterprise campus and between Ethernet LANs up to 8 km apart using just one or two pairs of standard 0.5 mm (24 AWG) voice-grade wiring.